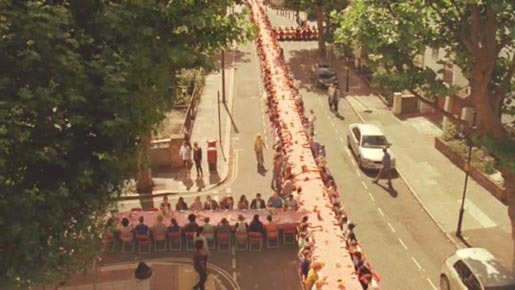 Kellogg’s UK is promoting Corn Flakes the breakfast cereal with “Big Breakfast”, a television commercial featuring a street party breakfast. Residents of a local neighbourhood wake up to discover tables, chairs and boxes of Cornflakes. Kelloggs is a great way to start the day, so why not invite the neighbours and make it a “Good Morning”. The Big Breakfast campaign was developed at Leo Burnett London by creative directors Don Bowen and Jim Bolton, art directors/copywriters Rick Brim and Daniel Fisher, agency producer Emma Bewley. Filming was shot by director Tim Brown via Spank Corp, London, with producer John Golley and director of photography Federico Alfonzo. Post production was done at Moving Picture Company, London. Editor was Mark Edinoff at The Quarry, London, by editor Mark Edinoff. Music, “Movin’ on Up”, by Primal Scream, was licensed by Sound Lounge.